It’s bad news for Ulster. Sam Hidalgo Clyne dives in for a first-half try. RICHARD COCKERILL’S EDINBURGH bounced back from successive home defeats to hammer a much-changed Scarlets side 52-14 to move one step closer to the Pro14 playoffs. An eight-try, bonus-point victory for the Scottish outfit is bad news for Ulster, whose slim hopes of a top-three finish in Conference B have been dented further. 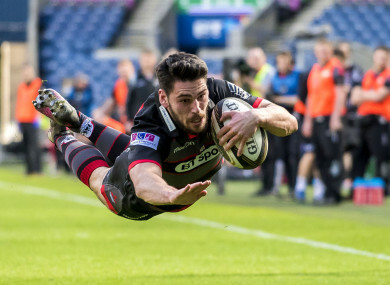 Edinburgh sit nine points clear of the province, who have a game in hand, and Ulster must hope Edinburgh take nothing from their final game against Glasgow Warriors, as well as claiming bonus-point wins in their final two outings, to stand a chance of progressing to the playoffs. It is, however, good news for Leinster as they now need just two more points from their games against Benetton — tonight at the RDS — and the inter-pro visit to Connacht in a fortnight to assure themselves of top spot in Conference B, and thus a home semi-final. Duhan van der Merwe scored two tries as the hosts ran riot at Murrayfield, with Edinburgh now heading into their final game against the Warriors in the knowledge a win would secure them a place in the quarter-finals, while a top-two finish is not behind the realms of possibility. Cockerill’s side ran in eight tries in total during a ruthless performance which sees the gap between themselves and Scarlets — who named a weak side with one eye on next week’s Champions Cup semi-final — close to just one point. Blair Kinghorn, van der Merwe, Sam Hidalgo-Clyne and Magnus Bradbury all crossed inside the opening 24 minutes to secure a bonus-point for Edinburgh and although Scarlets struck back through Tom Varndell and Dan Jones, the home side scored four more tries after the interval to strengthen their grip on third place. Email “Eight-try Edinburgh rip Scarlets apart to edge towards Pro14 playoffs ”. Feedback on “Eight-try Edinburgh rip Scarlets apart to edge towards Pro14 playoffs ”.